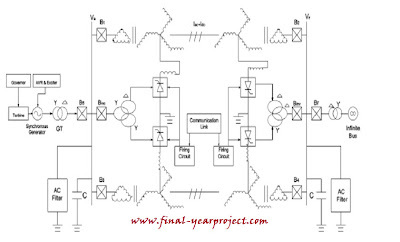 This is a good project on "power upgrading of transmission line by combining AC–DC transmission" for Electrical & Electronics engineer's for there final year project. 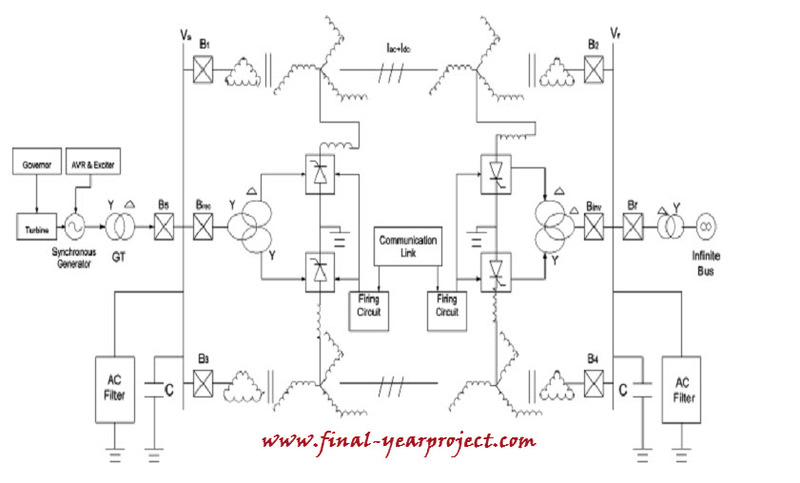 This project gives the feasibility of converting a double circuit ac line into composite ac–dc power transmission line to get the advantages of parallel ac–dc transmission to improve stability and damping out oscillations. This project report includes MATLAB simulation and result. You can also Subscribe to FINAL YEAR PROJECT'S by Email for more such projects and seminar. Above figure shows the basic scheme for composite ac–dc transmission. There are three ways of achieving this conversion: Natural commutated converters, Capacitor Commutated Converters & Forced Commutated Converters. The fundamental process that occurs in an HVDC system is the conversion of electrical current from AC to DC (rectifier) at the transmitting end and from DC to AC (inverter) at the receiving end. Use this report for your reference and study only. Use this report for your reference and study work.